This is a guide through the adventures of elementary, middle and high school life. It provides practical tools to encourage children and their families to have an effective and joyous school experience. Learn about empowerment strategies for parents and children. Understand homework and use of time, grades and test taking skills. Get help with problem solving skills. Identify your parent power. Find out about learning styles and learning differences and getting the right help for your child. Learn to use contracts to prevent risky behavior. Evaluate transportation to and from school, extracurricular activities and athletic programs. Find out about the importance of friends and classmates and much more. Brandi Roth, Ph.D and Fay Van Der Kar-Levinson, Ph.D are psychologists, consultants and educators. Their first book CHOOSING THE RIGHT SCHOOL FOR YOUR CHILD has guided many parents through the process of school selection. 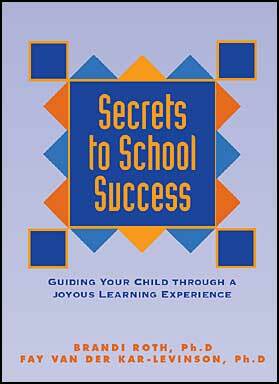 SECRETS TO SCHOOL SUCCESS guides families through the adventures of elementary, middle and high school life. Their book provides practical tools to encourage families to have an effective and joyous school experience. © Copyright 2017, Association of Ideas Publishing, All Rights Reserved.